Without being too spoilery here, because it's gonna get super spoilery below, one of the most poignant moments in Star Wars: The Force Awakens came courtesy of the movie’s own villain, Kylo Ren. In a recent interview, director J.J. Abrams opened up about THAT particular scene, explaining the reasons the character did what he did. WARNING: Massive Star Wars: The Force Awakens SPOILERS below! If you’ve already seen Star Wars: The Force Awakens a bazillion times (or even once), then you know that one of the most powerful scenes of the movie was when Kylo “Ben Solo” Ren killed one of the most iconic and beloved characters in Star Wars history — his own father, Han Solo (Harrison Ford). This moment marked the final turn to the Dark Side of Kylo Ren (Adam Driver, who was simply amazing in the role) and probably created one of the most hated characters in the history of the franchise in one fell swoop. In a recent interview with Entertainment Weekly during a post-screening Q&A at the Writers Guild of America, J.J. Abrams opened up about that shocking, devastating scene and talked about how he felt this had to happen because of a little thing called character development. 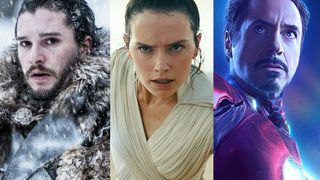 Michael Arndt, who helped create the new tale set in a galaxy far, far away before Abrams and Lawrence Kasdan got their hands on the story and wrote the script, revealed that Kylo Ren’s beginnings were as a means to separate the beloved heroes we all know and love from the original trilogy. I think it's not only heartbreaking that Han died at the hands of his long-lost son, but it's also gut-wrenching to know a different fate originally awaited our beloved space rogue; one that didn’t include being slain by his own child. What did you think of Kylo Ren ultimately killing his father? Do you believe Han Solo's fate should have been different?